What makes you magnificent? MAC Cosmetics wants to know! 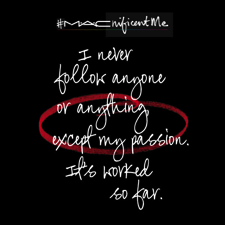 Until December 12th, log on to http://macnificentme.com/ to share your MACnificent features, both inside and out, for the chance to win the incredibly exciting privilege to be the face of their colour 2015 campaign. Six winners will be photographed by a prestigious fashion photographer in New York City to truly capture the essence of their MACnificentness, and the images of the campaign will be shared with the world for all to see! All you need to submit is a headline, brief essay and photo (selfies encouraged!) at http://macnificentme.com/. Best of luck, beauties!